UPDATE: Online Ticket Sales have closed. Tickets are still on sale at the door! 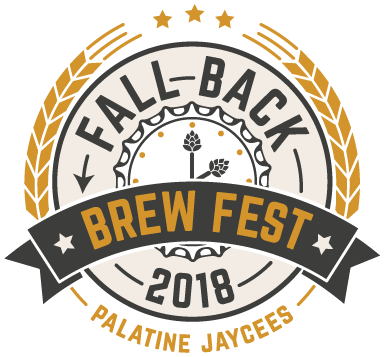 Bring your friends and enjoy a crisp fall day sampling nearly 150 beers from over 50 breweries at the 2nd Annual Fall Back Brew Fest in Palatine, IL! The event is hosted by the Palatine Jaycees and will be located in the Aquatic Center parking lot featuring a selection of local & national breweries along with food trucks & music! More breweries will be added soon. VIP tickets include a souvenir tasting glass, early entry at 12:00 pm, 25 - 3oz tastings plus a special selection that won't be available during the General Admission session. There are a limited number of VIP tickets available! Early Bird VIP tickets are $40 and only available until August 31st or sold out! Advanced VIP tickets are $50, available until November 2nd or sold out! At the door VIP tickets are $60 (cash only), if still available. General Admission tickets a include a souvenir glass and 20 - 3oz tastings with entry beginning at 1:00 p.m. Designated Driver tickets are $10 (in advance & cash only at the door). Only attendees 21+ will be admitted. IDs will be checked at the door for all attendees. ALL TICKET SALES ARE FINAL. Tickets are non-refundable. The festival will occur rain or shine.